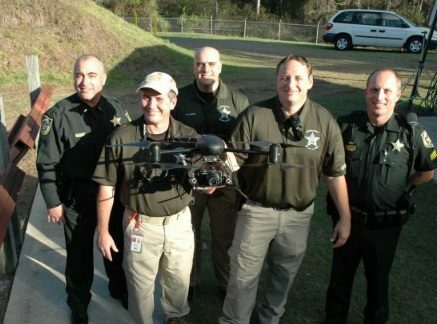 TALLAHASSEE, Florida -- Lawmakers and police continued to wrangle Wednesday over when law enforcement should be allowed to use unmanned drones, trying to settle on where the tipping point is on the balance scale of liberty and public safety. The chief advocate in the Legislature for what originally was envisioned as a hard ban on police use of the remote control aircraft has already compromised to allow exceptions, including situations where police get a warrant, or where there's an imminent risk of something like a terrorist attack. But bill sponsor Sen. Joe Negron and police couldn't agree Wednesday on the use of drones as extra eyes in the sky at large-crowd events, such as a football game. Capt. Michael Fewless of the Orange County Sheriff's Office told the Senate Community Affairs Committee that police would like to be able to use drones to videotape big events like college bowl games, where there is no expectation of privacy. "If there was a problem and the drone is flying, and the crowd starts to scatter, any evidence that's caught on that drone, on that camera, cannot be used as evidence," Fewless said. "So if we have somebody in there with the crowd scattering – their child gets grabbed by somebody else and they take off in a different direction – even though we now have the suspect on video, we cannot use the drone evidence under this current language. And we don't want that." But Negron, R-Stuart, said monitoring crowds goes too far – and that he'd vote against his own bill (SB 92) if it were changed to allow that. "Can you imagine if King George had sent a drone to hover over the Boston Tea Party to see what the American patriots were up to?" he asked committee members. "It's not what this country was founded on." The measure, without any changes to allow crowd control, was approved unanimously, but has three remaining committee hearings before a floor vote. And several lawmakers asked Negron to consider further changes. "Yes, we have a responsibility to protect liberty, said Sen. Jack Latvala, R-St. Petersburg. "But we also have a responsibility to protect lives." Sen. John Thrasher, R-St. Augustine, asked if law enforcement officers could gather evidence in a large crowd situation in another way, such as from a helicopter. Fewless said yes. "But it does appear to me to be a slippery slope when you start saying we can't use it for a drone that's much cheaper for an agency to operate compared to a helicopter that's much more expensive to operate," he said. "Protecting liberty is a slippery slope," Thrasher replied. "And I think that's what Sen. Negron's bill is trying to do." The drones cost about $50,000 apiece, according to Fewless, and require only the cost of gas, compared to $400 an hour to operate a helicopter. The Orange County Sheriff's Office has two drones and three helicopters. Police in Miami also have drones, although so far their use has been limited. Negron said he wants to protect what he considers the right of Floridians against unreasonable search and seizure before the use of drones becomes "ubiquitous." Latvala said he'd like to see the drones used for surveillance of marijuana grow fields, but Negron said that could be done with a regular search warrant. Florida would be the first state to pass such a ban on the use of unmanned aircraft by police, according to the American Civil Liberties Union, which supports Negron's bill. A House companion bill (HB 119) by Rep. Ritch Workman, R-Melbourne, who represents Brevard County, comes up Thursday for the first time in the House Criminal Justice Subcommittee.